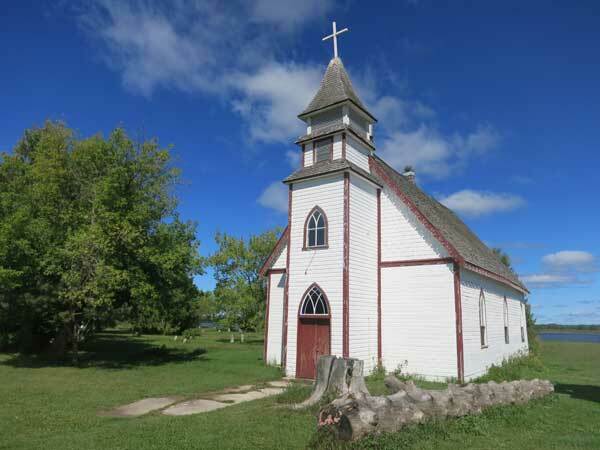 Perched on the south bank of the Winnipeg River and surrounded by the boreal forest of an ancient Ojibway habitation, this lovely small Anglican church was constructed between 1868 and 1870 in traditional Red River log frame technique and covered with white clapboards for protection from the elements. It was built by local parishioners living in the fur trade post of Fort Alexander, on land donated to the church by the Hudson’s Bay Company. It is now the community of Sagkeeng First Nation. Its simple but durable design is typical of many prairie churches of all denominations, here enhanced by the use of pointed Gothic windows, beautiful hand-carved interior furnishings and exterior bargeboard trim with unique cutouts of leaf and wave to symbolize the strong influence of the forest and water. The church is surrounded by a large, interesting cemetery and has a separate bell tower beside it. No longer used in winter, the original church stands adjacent to the newer Christ Church Anglican, but is maintained by the local community. A cemetery is situated immediately west of the former church building.